Children play at Amazing Grace Children's Home in South Africa. Photo courtesy of AFP. 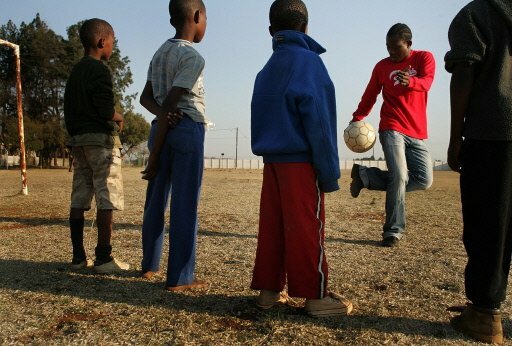 South African government officials fear child trafficking could increase during next year’s World Cup event . Schools will be closed between June 11 to July 11, and officials said more children could be recruited during this period to sell goods on the street or become prostitutes, according to this Agence France-Presse article. The article also said a social worker saved 10-year-old Thato from prostitution. The Lesotho-born girl was brought to South Africa by a woman known as “granny” and sold into prostitution at age 8. Thato was taken to Amazing Grace Children’s Home. The National Association of Social Workers is an opponent of child trafficking. To find out what NASW is doing to address this worldwide problem check out NASW’s Peace and Social Justice and Child Rights and Protection Web pages. There is also Better Care Network, a coalition of organizations and individuals who are concerned about children who don’t have good family care. NASW member Jon Singletary, Baylor University assistant professor of social work, sits on the Better Care Network’s Faith-Based Organization (FBO) Outreach Committee.